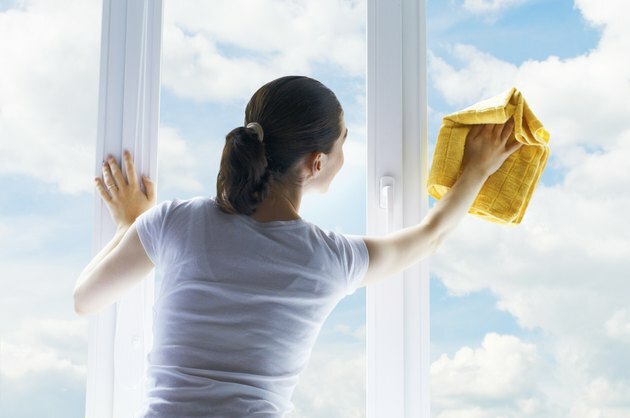 Glass is one of the more frustrating items for homeowners to clean because it clearly displays dirt, fingerprints, grease and other liquids, and cleaning the glass often leaves unattractive streaks. While many commercial glass cleaners are available, glass can also be cleaned with a simple, inexpensive combination of rubbing alcohol and water. Before you spend a lot of money on a brand-name commercial cleaner, try a homemade remedy for making your glass sparkle. Rubbing alcohol and water make your windows sparkle. Wipe the glass with a microfiber cloth to remove loose dust. Pour 1/2 cup of rubbing alcohol in a quart-size spray bottle and fill the rest of the bottle with water. Shake the bottle to mix the contents. Spray the glass with the rubbing alcohol solution. Allow the cleaner to sit for a minute to dissolve dirt, grease and other stains. Polish the glass with newspaper to leave a clean finish with no streaks.